1. Shri sunil Garg joined IPS in the year 1992. Prior to his appointment as IPS he was SDM Udaipur (Rajasthan). He belongs to Rajasthan. 2. Arunachal Pradesh: In february 1995, he was posted to Arunachal Pradesh. In Arunachal, he worked as SDPO Itanagar and Namsai, as SP Tezu and Principal PTC Banderdewa. The officer was granted “ Special Duty Medal” by the government for outstanding performance, The officer’s excellent work was appreciated by the then IGP and Home Minister by issuing six appreciation letters. a) In September 1998 he was posted back to Delhi Police, In the year 1998, while working as Principal PTC, Delhi Police he has ‘modernized the training facilities like classes through Multimedia Project, Computer Laboratory, Auditorium, Meditation Hall, Cyber Crime Cell, and various Sports facilities. The meditation (Vipasana) courses for more than 1000 police officers were organised, Dr. Kiran Bedi has issued two appreciation letters during this period. b) In the year 2000 Shri Sunil Garg was posted as Addl. DCP/North West Ashok Vihar. Due to his sincere efforts, major cases of kidnapping for ransom were solved, which had an arm encounter with the kidnappers in Sonepat. He got seven appreciation letters from Commissioner of Police during this posting. c) The Parliament Attack: In the year 2001, he was posted as Addl. DCP/New Delhi. On 13th December 2001, terrorist had attacked parliament. He was the first police officer from New Delhi District to reach immediately on the spot in Commando Bus and cordon the parliament by deploying the commandoes at various places and flashed the wireless message. The initial investigation of the case was taken up under his close supervision, which ended up in conviction of terrorist. d) In the year 2002-03, he was promoted and posted as DCP/PM Security. During this period, the security arrangement for Independence Day 2002, Republic Day 2003 and Pravasi Bhartiya Diwas were planned by the Officer. He was awarded six appreciation letter from the seniors. 4. Pondicherry: In the year 2003, he was posted as SSP/ Pondicherry. The Lieutenant Governor of Pondicherry, the Speaker of Assembly, C.S. & IGP have appreciated role of the officer for outstanding work. He received total 11 appreciation letter during this period. The Tsunami: After hearing about the news of “Tsunami on the coastal area in Pondicherry on 26.12. 2004, Shri Sunil Garg along with his police team reached the spot and put his entire team in rescue work. The people stranded in the water were taken out from the sea by Shri Sunil Garg, At the time, when people were scared of coming near the sea water during Tsunami, Shri Sunil Garg, at the risk of his own life jumped into depth of water and saved lives of many people who otherwise would have perished. The gallantry act of the officer was considered by the Govt. of Pondicherry as an extraordinary work. The Govt. of Podicherry, Lieutenant Governor and C.S has given appreciation letter vide No. 34/2005/Home dated 16.02.2005. The Govt. of Pondicherry has recommended “Shaurya Chakra” to MHA, Govt. of India. a) In July, 2005, he was posted back to Delhi Police and posted as DCP/Noth District. 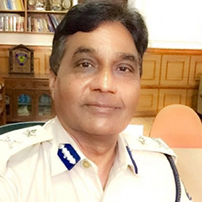 As DCP North, he has handled various Law and Order arrangements specially, the Ramlila Arrangement-2006, various sealing drive on the direction of Supreme Court, Security arrangement during 15th August 2006 at Red Fort. He received two appreciation letters from the Commissioner of Police. The officer has taken various initiatives for implementation of CIPA Project, installation of CCTV Cameras in all busy markets, petrol pumps, ISBT, temples, mosques etc. The officer has launched various “Area Security Committees” in the communally sensitive areas. b) In the year, November 2006, the officer was promoted as Addl. CP (DIG) and posted as Addl. CP/PM Security. He has meticulously planned security arrangement for PM of India on various occasions especially during 15th August 2007, Republic Day 2008, SAARC Summit, Afro- Asian Summit, etc. c) Commonwealth Games-2010: The opening and closing security arrangement at Jawahar Lal Nehru Stadium for 2010 Commonwealth Games were supervised by Shri Sunil Garg efficiently. On 15th August 2008, he was awarded President Police Medal for Meritorious Service. On April 2011, he was promoted to Joint Commissioner of Police (IGP). d) The President House: In the year 2012, he was posted to President House. He has planned security arrangement for Swearing-in-Ceremony of Shri Narendra Modi on 26.05.2014 at Rastrapati Bhawan. The Commisioner of Police has awarded appreciation letter. 6. Goa: On 1st Sept. 2014, he has joined as IGP, Goa. He has undertaken various initiatives to make Goa Police a public friendly. He has launched Senior Citizen Helpline, dedicated E-mail for women complainants, Women Helpdesk in all Police Stations. Regular Public Meeting, Anti-Corruption Helpline and Up-gradation of Forensic Science Laboratory, Website of Goa Police, etc. In acknowledgement of his outstanding contribution, the Chief Minister of Goa has awarded him appreciation letter on 15th Aug 2015 he was awarded President Police Medal for Distinguished Service (PPM). 7. Delhi Police: He jouined back to Delhi Police on Nov 2016 as Joint Commissioner, President Security and VVIP Security. 8. On 26.10.17 He joined as IGP Arunachal Pradesh. 3) Appreciation letter from Commissioner of Police, Delhi for security arrangements of Swearing- in Ceremony of ShriNarendraModi on 26.05.2014. 4) Appreciation letter from Chief Minister of Goa, for taking various initiatives like Community Policing, Regular Public Meeting, Senior Citizen Helpline, various measures for Safety & Security of Women , Fitness Skill for police personnel, welfare measure for police personnel and above all various measures to control Crime in Goa. 5). President’s Police Medal for Distinguished Service (PPM) : He is recipient of above medal on occasion of Independence Day 2015. 	“VIP Protection Course” at Albuquerque, USA From 08.02.2003 to 28.02.2003. 	Mid-Career training Programme at Cambridge University, UK from 26.05.2003 to 08.07.2011.